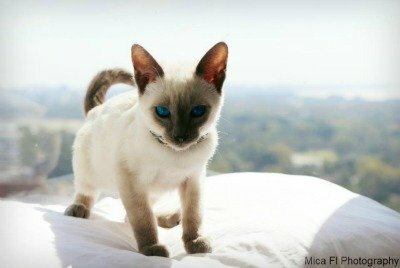 Gentle, loyal and loving, Blue Point Siamese cats are the home-bodies of the Meezer world. These are really 'purry-furry' cats! They ask nothing more than to be close to you, to be carried around on your shoulder and to gaze into your eyes (which is quite unusual, as to most cats a direct stare is regarded as aggressive). They'll purr for hours when they're around the people they love. 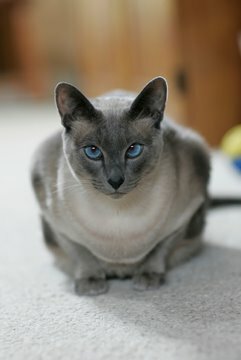 The Blue Point Siamese is related genetically to the Seal Point, being a 'dilute' or in other words, paler version of the darker, brownish-black Seal. Blue Point coloring is cold-toned and grey. Their points are deep slate-grey-blue (faces, ears, tail, paws, nose leather and paw pads), with bluish-white, cold-toned fur. Occasionally you may find Blue Points with lighter, silvery-blue points rather than slate-grey ones, but they always tend to be darker and bluer than the pinkish-toned Lilac Point. A Blue Point's coat (like that of a Seal Point) will tend to darken with age, unlike that of a Lilac Point which stays white throughout their life. 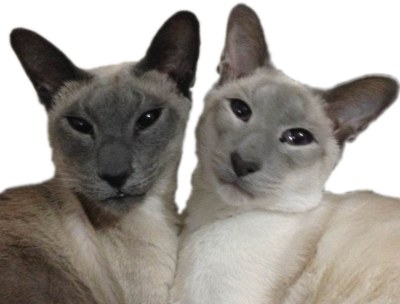 The beautiful pair of cats below are Mia and Gizmo, and I'm delighted to welcome them to these pages because their owners Sarah and Andy adopted them from the Siamese Cat Club Welfare Trust, where my own cat Bandit came from! Mia, aged 6, is the Blue Point on the left (as you look at the picture) and you can see that she is, overall, a much darker cat than Gizmo (3) the Lilac Point on the right who has a paler, silver-grey face, ears with a pinkish undertone, and a pale coat. Sarah also told me that both cats very affectionate; Mia is vocal and chatty whereas Gizmo is very lively and knows how to open doors! A cat with a blue rinse? Doreen Tovey, the much-loved author of 'Cats in the Belfry' and other novels about life with Siamese cats as well as squirrels, horses, donkeys and other animals, described the Blue Point as 'a Siamese that has apparently just had a blue rinse'. And she should know - she owned several of them during her lifetime! And they do look rather as if someone had just puffed a cloud of blue powder over them, don't you think?